Spring in California's Russian River Valley couldn't be more rewarding for outdoor adventurers and laze-abouts alike. The weather last weekend was a perfect 70 degrees, the birds were chirping crazed, the breeze just barely kissing our cheeks. Perfection. 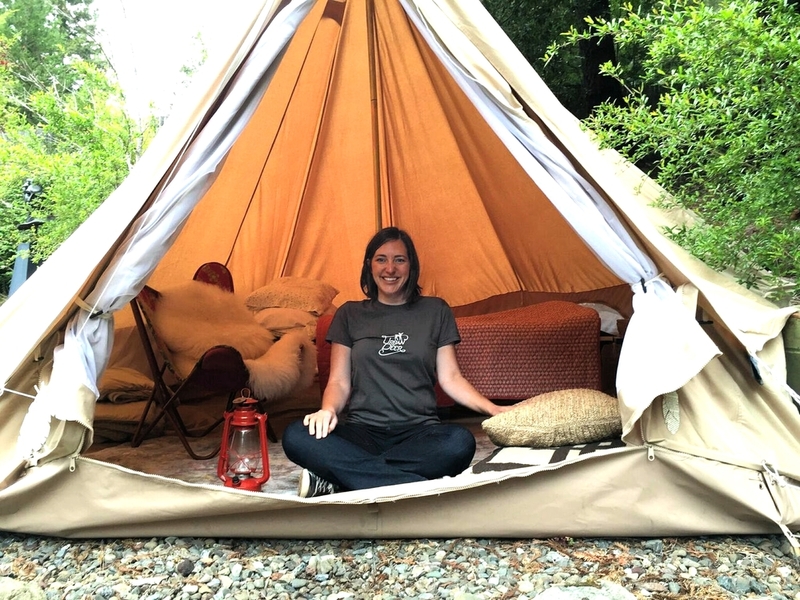 Perfect, too, was our first time setting up our new canvas bell tent for the Urban Deer Retreat. I had it up and ready for glamping in less than 20 minutes. These genius tents date back to the 1800s, where manufacturers adapted the classic teepee design for western military use. The design is a simple structure, supported by a single central pole, covered with a cotton canvas. The stability of the tent is reinforced with tension by guy ropes connected around the top of the walls and being held down by pegs around the circumference to the ground. Our tent has a circular floor plan of 13 feet - plenty of room for two queen size beds, believe it or not! We had a confined space, blocked by two immovable potted plants, so we couldn't stretch out the tent as much as we would have liked but it worked out for one person. Gretchen was the lucky inhabitant of the tent this weekend and from her perch she had a pretty epic view of the redwoods, morning mist, and soaring hawks. It's waterproof and mold resistant, so she was snug as bug, knowing she was protected from the elements. What makes for a happy glamper? A good night's sleep! Getting your bed situation just right is the most important first step. We got a full twin size cot and mattress fit for a queen and glamped it up with high thread count sheets and down pillows. Your little home away from home may only be one room but you can easily make it seem like two with the addition of a tent living room. Add a chair, like the easy to transport yet high on style Butterfly Chair. Lay down a rug and toss in some comfy floor pillows to complete the space. Hanging atop the tent's center pole was just one light source, but it kept the space nice and bright in the night. We chose a vintage-style red lantern with more modern LED technology. To help Gretchen feel right at home, we added a bedside bench with books on how to build a fire, a memoir from the sassy Miranda July, and a basket of toilet paper should she want to tinkle in the night! Ready to get your glamp on? Start with your home base – check out our glamping bell tent on sale now!